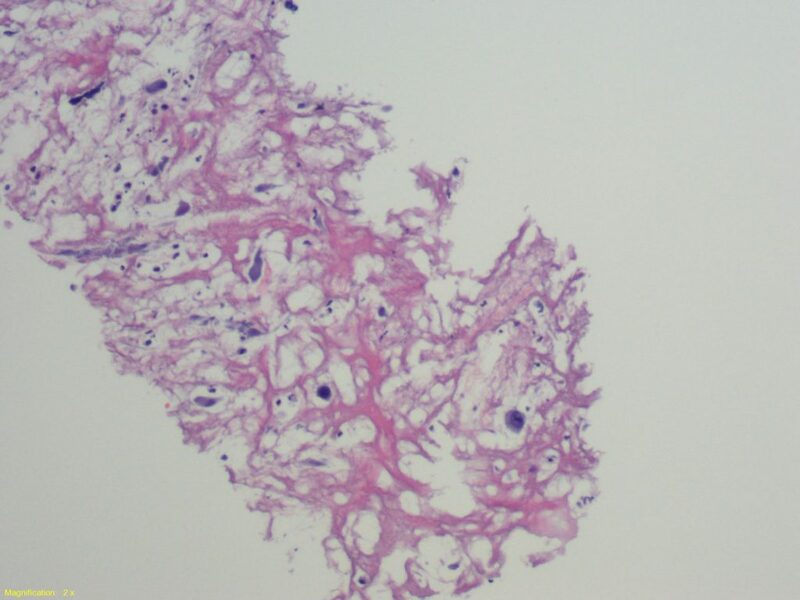 Microscopic description: Ischemic fasciitis may present as a pseudosarcoma, and cytology findings in this setting can be a diagnostic challenge. 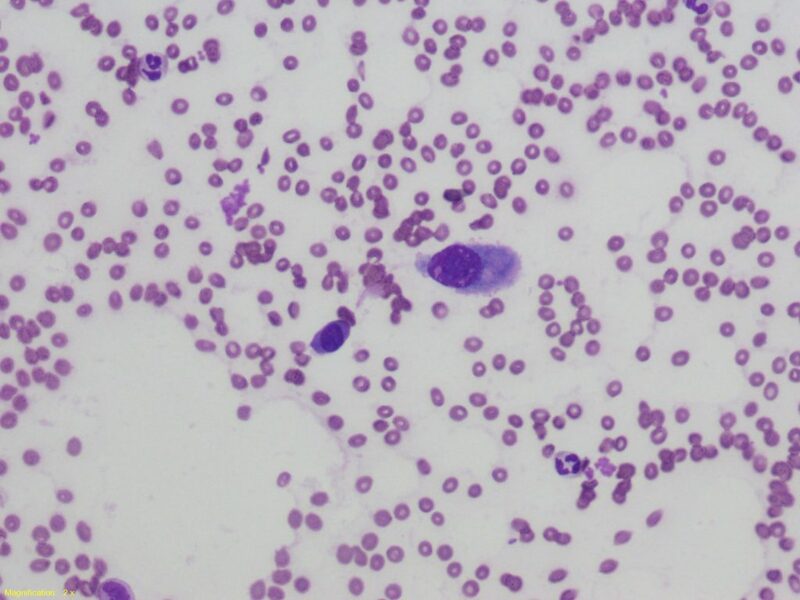 Endothelial cells are atypical and on cytology may appear as hyperchromatic and epithelioid with increased nuclear-cytoplasm ratio. Fibroblasts may be markedly atypical. They are usually increased in size and have abundant eosinophilic or amphophilic cytoplasm. Nuclei are enlarged and often have prominent nucleoli leading to a resemblance of ganglion cells. This particular case was extremely hemorrhagic. Most passes were predominantly blood. On-site evaluation was key to ensure adequate sampling. There were rare pleomorphic cells present and a core was necessary to obtain for ancillary studies. Differential Diagnosis: Given the pleomorphism of these fibroblasts, one may consider any number of malignancies. Melanoma is in the differential. 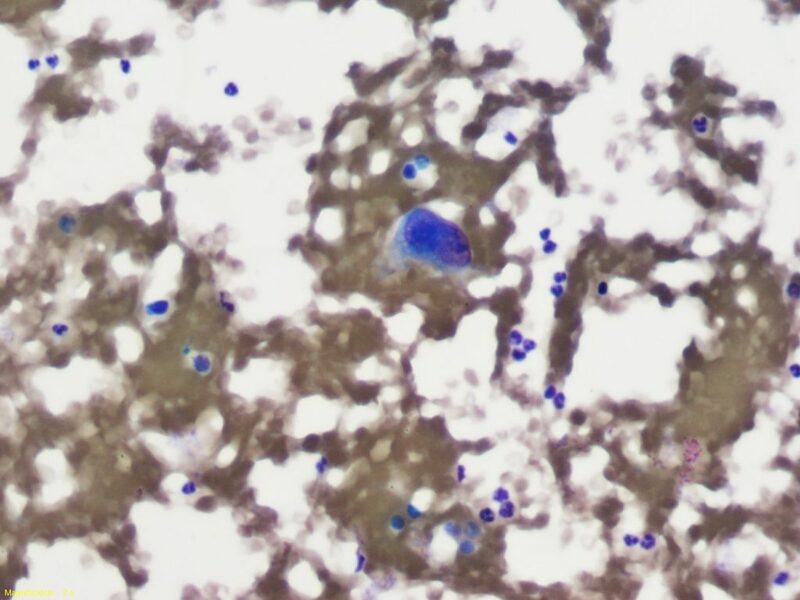 Immunostains such as Sox10 and HMB45 can easily differentiate the two lesions. Given the hemorrhagic nature of the lesion and the older demographic, angiosarcoma is in the differential. ERG, CD34, and CD31 can be used to differentiate this neoplasm. Endothelial cells may show atypia in the setting of ischemic fasciitis. These cells will stain with vascular markers, but the markedly pleomorphic fibroblasts will not. It is key to ensure visualization of the fibroblasts while evaluating vascular markers if angiosarcoma is in the differential. Given the potential paucicellular nature of the specimen, sampling of nothing more than blood may lead one to inaccurately diagnose a hematoma. It is also a prudent idea to stain for pancytokeratins to rule out a poorly differentiated or sarcomatoid carcinoma.